St. Elizabeth was the mother of John the Baptist and the wife of Zacharias according to the Gospel of Luke. According to the Gospel of Luke, Elizabeth was a descendant of Aaron the high priest, Luke 1:5-7. She and her husband Zacharias were “righteous before God, walking in all the commandments and ordinances of the Lord blameless” 1:6, but childless. While Zacharias was ministering in the Temple of the Lord, he was visited by the angel Gabriel, Luke 8:12. In Luke 1:13, “But the Angel said until him, fear not, Zacharias; for thy prayer is heard; and thy wife Elizabeth shall bear thee a son, and thou shalt call his name John”. Luke 1:14, “And thou shalt have joy and gladness; and many shall rejoice at his birth”. Luke 1:15, “For he shall be great in the sight of the Lord, and shall drink neither wine nor strong drink, and he shall be filled with the Holy Ghost, even from his mother’s womb”. Zacharias doubted this since both he and his wife were very old. The angel identified himself as Gabriel and said he would be “dumb, and not able to speak” until the words were fulfilled, because he did not believe. In Luke we read, “And after those days his wife Elizabeth conceived, and hid herself five months, saying, thus the Lord dealt with me in the days wherein he looked on me, to take away my reproach among men”. According to the account, the angel Gabriel was then sent to Nazareth in Galilee to her “cousin” Mary, a virgin, espoused to a man called Joseph, and informed her that she would conceive by the Holy Ghost and bring forth a son to be called Jesus. After, Mary was also informed that her “Cousin Elizabeth” had begun her sixth month of pregnancy, and traveled to visit her. Luke 1:41-45, “And it came to pass, that when Elizabeth heard the salutation of Mary, the babe leaped in her womb; and Elizabeth was filled with the Holy Ghost. And she spake out with a loud voice, and said, Blessed art thou among women, and blessed is the fruit of thy womb. And whence is this to me, that the mother of my Lord should come to me? For, lo, as soon as the voice of thy salutation sounded in mine ears, the babe leaped in my womb for joy. And blessed is she that believed, for there shall be a performance of those things which were told her from the Lord”. 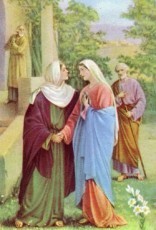 St. Elizabeth was the mother of John the Baptist. Her husband was a priest in the temple, and angel Gabriel appeared to him, telling him his prayer was heard, and Elizabeth would bear a son in her old age. He doubted, and was unable to speak until the birth of John. Elizabeth greeted Mary in her six month of pregnancy, and John leapt in her womb. St. Elizabeth proclaimed to Mary, “Blessed art thou among women, and blessed is the fruit of they womb” – a part of the Hail Mary said daily by millions of people.